NEW YORK, NEW YORK – February 15, 2018 - GameChange Solar today announced that it has launched a value added service making the Genius Tracker™ single axis tracker utilizable on undulating and sloping ground conditions. 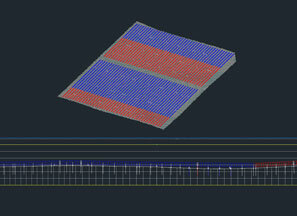 The service entails a detailed analysis of the tracker system layout in AutoCAD® Civil 3D®. 2D slices are then analyzed for proper tracker slope design to minimize or eliminate any grading requirements, often utilizing extra long extra piles in valleys so the trackers can span rapid and significant undulations while minimizing or completely eliminating the need for costly grading.